Tired of white kitchens? Then you’ll love this fresh space designed to entertain loads of kids and families at a just-finished getaway house on Lake Minnetonka. 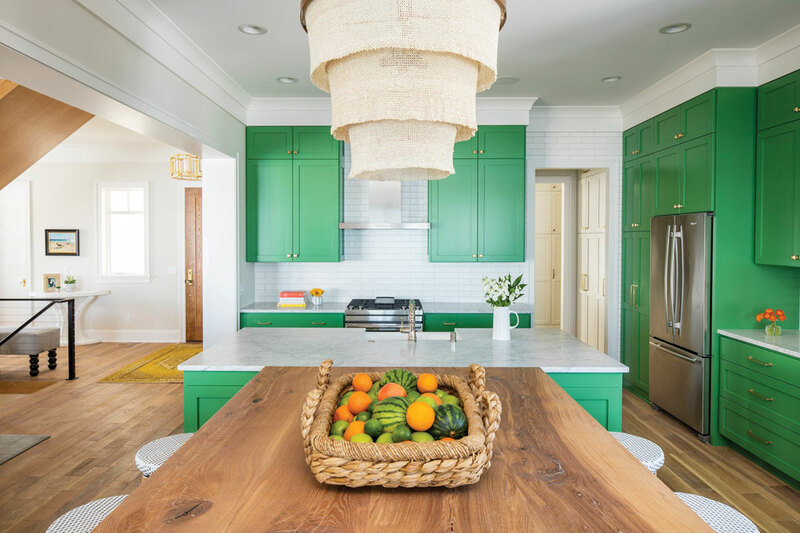 Green was the obvious choice for homeowner Rebecca Remick, general manager of City Homes, and Rebecca Van’t Hull, senior interior designer at Martha O’Hara Interiors—after both Rebeccas discovered they share a love of kelly green. Van’t Hull added gold hardware to pop against cabinetry painted Benjamin Moore Bunker Hill Green, honed Carrara marble countertops, white subway tile, and the beachy chandelier of woven coco beads from Made Goods. The large table for serving and seating in the crowd-friendly kitchen is oak, milled from trees cleared for City Home’s Edina development, Sidell Trail.